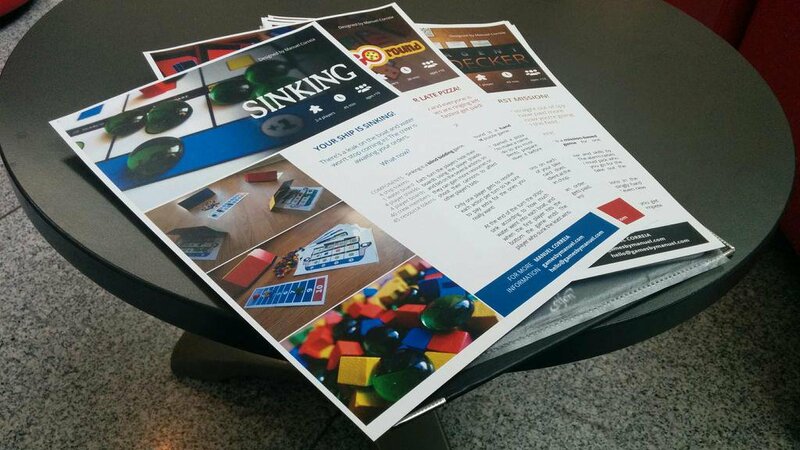 Last week we covered the first half of the necessary preparations to pitch your board games at Essen Spiel. This week we’ll cover the rest. Keep reading and you’ll be ready in no time! An essential part of the process. You don’t know what you’re going to find when you show up to a publisher meeting so there might not be enough time to set up a game or show the components – I had a couple meetings where there wasn’t even a table! With a good sellsheet you won’t need anything else. To put it simply, sellsheets are full page ads for your games. They should show the game’s name, theme, mechanics and components at a glance, with clear photos to paint a good mental picture. If you pick the game’s photos so that you can use them to teach the game, even better! That way you don’t even need to take it out of your backpack. At the end of the meeting let them keep it! Publishers will be looking at so many games during the event that naturally they’ll start to blend together. This is a great way to make sure they don’t forget it, and it’s also useful so they can show it to the rest of their team. It’s good to have at least one physical prototype with you. The publisher may want to see the components, how much room it takes or even the rules. When talking about the game it’s possible you want to refer to something that isn’t on the sellsheet so it’s handy to have it around. There’s a small chance they’ll even ask you to set it up so they can play a couple of rounds! If the publishers are interested in the game it’s very likely they will ask for a prototype. Unless you’re using very specific components it’s safe to assume they already have them at the office so don’t be surprised if they just ask you to e-mail files they can print and play. Otherwise they might ask for a physical prototype! If you’re having multiple meetings in one day, be sure to bring more than one copy. This last step is entirely optional but I found it very handy! Compile a schedule with all the information you have about the meetings, the name of who you’re meeting, the time and what games they showed the most interest in. If you’re having a lot of meetings a small description of the type of games they publish is a really good way to regain focus from one to the next. Print out the floor plans for the halls and mark down the booths in which you’ll have the meetings. If the schedule is too dense, you can also use this to figure out the fastest way between them. There are some moments where the halls are so crowded there’s not enough room to reach into your backpack and take out a map. My solution was to fold them in half and keep them inside a notepad which I used to take notes throughout the event. That’s it for the preparations! Follow this link to read Part 3, which will cover key points during the event itself!